Detached holiday home with a fenced garden with south facing terrace. The garden is full of apple trees which provide ample shade. The house is located only 3 km away from the beautiful, wide sandy beach of Beg Meil. Take your bicycles with you, because there are several bike trails that crisscross the landscape. They take you through small fishing villages and along beautiful coasts. In Fouesnant (2 km) is a water theme park where your children can have an unforgettable day. 18-hole golf courses at La Forêt-Fouesnant (4 km) or Clohars-Fouesnant (8 km). 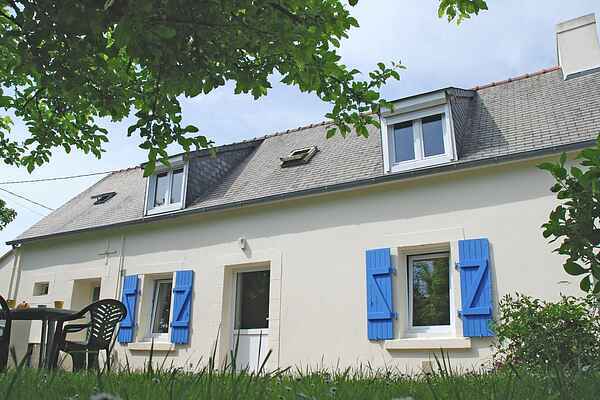 Tennis court, bakery and restaurants in Beg Meil ​​(2 km). Supermarket and swimming pool in Fouesnant (5 km). Day trips can be made to the beautiful medieval town of Quimper (20 km) and the attractive fortified town of Concarneau (17 km) where you can do some great shopping within the old city walls. From the port of Concarneau, you can go on a boat trip to the enchanting archipelago of Glénan. In the picturesque Pont-Aven (30 km) you will discover where the famous painter Gauguin got his inspiration from. Also fun for the children: the zoo in Pont-Scorff (20 km).